Arsenal manager Arsene Wenger says he is in the market for a new midfielder following the sales of Gilberto Silva, Alexander Hleb and Mathieu Flamini. Samir Nasri and Aaron Ramsey have already been brought in, but Wenger says worries over three other midfielders have prompted a rethink. "Alex Song is going to the Olympics, while Abou Diaby and Cesc Fabregas have yet to start pre-season," he said. "We will need one more body, though there is no special name on the list." Gilberto, Flamini and Hleb departed for Panathinaikos, AC Milan and Barcelona respectively, and Wenger added: "If we find a reasonable target then we will do it. We have some time. We have until 31 August." The arrivals of Nasri, 21, and Ramsey, 17, from Marseille and Cardiff, represent Wenger's only movements in the transfer market this summer. Ramsey made his debut for Arsenal as they won 2-1 at Barnet in a pre-season friendly on Saturday, with Jay Simpson and Dutch youngster Nacer Barazite scoring in the second half to cancel out Kenny Gillet's strike for the hosts. And the young Welshman also started in the Gunners' 1-1 draw with Hungarian side Szombathelyi Haladas on Wednesday, with Wenger saying: "He is in the plans for the new season like all the players today. "It depends on the performances and their quality and you could see that some young players could be very close to the first team." However, despite saying last week that his squad is now "level", the Frenchman admits he is now keen to dip bolster his midfield. One name who could be on that list is Aston Villa midfielder Gareth Barry, whose desired move to Liverpool has yet to materialise following a summer of speculation. Another - Miguel Veloso - is reportedly willing to leave current club Sporting Lisbon if the right offer comes along, says his agent Paulo Barbosa. "He will leave only for a club with a different dimension and is good for him and Sporting," Barbosa said. "Miguel will not leave for an average club that cannot match his expectations or surpass what Miguel could do at Sporting. The player, like any professional would be open to offers." Meanwhile, Hleb says Arsenal are guaranteed to stay around the top echelons of the Premier League as long as Wenger is at the helm. 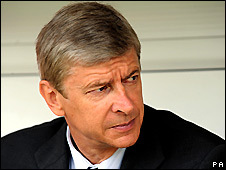 "If Arsene Wenger stays at Arsenal, they will always play at the top," he said. "He is everything for Arsenal. "Arsene Wenger, for me, is like a father. He gave me a lot and I learned a lot from him and I need to say thank you to him for the fact that I now play in Barcelona."